Like many teenage boys in the 1980s, I was into Dungeons & Dragons. I didn't actually play all that much, but I had many of the books and boxed sets and magazines and such. And nestled in the back of each issue of Dragon Magazine was a serial adventure comic told in three-page increments. 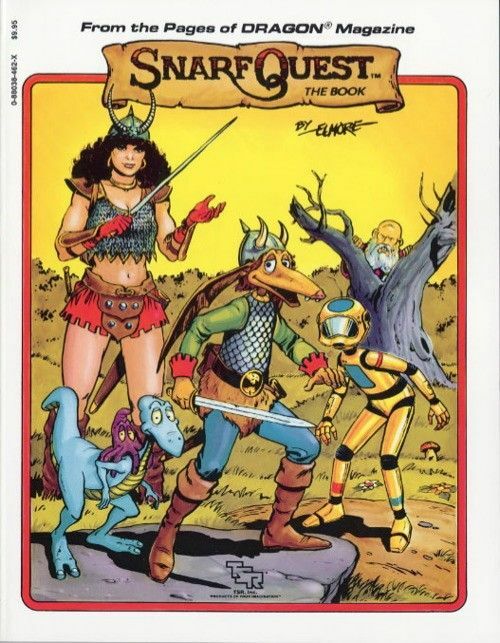 It was by none other than Larry Elmore, who called his story "SnarfQuest" after the lead character. Larry Elmore was THE artist for Dungeons & Dragons, illustrating many covers as well as providing lots of spot illustrations throughout the various books. I had already known him as a talent painter and to see him regularly do an actual story was a thrill! Of course, this was back when I was still in my early teens. And it was the 1980s, so everybody's sense of style was pretty warped. So maybe I wasn't looking at things too clearly. About three or four years ago, I stumbled across a collected edition of those SnarfQuest stories entitled, appropriately enough, SnarfQuest: The Book. I was thrilled once again since I didn't actually have ever installment of the story -- I only picked up Dragon sporadically and was missing a good chunk of the middle of the story. But that was still nostalgia working. I went to take another look at recently to see if I could look at it a little more critically. The story is a sword-and-sorcery style fantasy focused on Snarf, a kind of bat-faced regular Joe of a guy who's trying to make something of himself. When his village's king dies, the citizens are all given a year to do as many great and heroic things as they can, and the one who comes back with the biggest reputation and most wealth will become king. Snarf then sets off to seek his fortunes. Adventures abound as Snarf teams up with the likes of Raffendorf (a prince enchanted into a giant rat), Aveeare (a time-travelling robot) and Willie (a giant dragon who thinks he's a duck). The art, as to be expected from Elmore, is beautiful. He seems to have a knack for drawing everything with ease. He also does impressively well on the storytelling. Though he doesn't take many risks in that regard and sticks mainly to fairly standard page layouts, he still conveys the story well, regardless if it's a fight scene or talking heads or wildly careening through the middle of a town. The only "complaint" one can really lodge against the art, I think, is some of the costume choices Telerie makes when she finds some clothes from the future -- they're perhaps a bit too rooted in the mid-1980s. The story has a good set-up. There's an overarching plot that holds things together, but also allows for the story to be told in a series of almost random adventures. Some things are more dangerous than others, some challenges require wit over skill, some adventures allow for more comedy... There's ultimately a good mix of all of that. Perhaps where it falls down a bit is in the way characters flit in and out of the story. It feels a bit like Elmore would throw in a character he thought could work, only to realize a few months later that he didn't have much of anywhere to go. Which might well be the case, since Elmore was cranking out quite a bit of work at the time and I believe this was his first sequential art piece. But it does lend a sort-of flying-by-the-seat-of-your-pants feel to the story. Which actually kind of works for the set-up/setting, bearing in mind that a lot of D&D games that got played had players in and out of games as their schedules might not always permit the exact same group to always play together over the extended period that a single adventure might last. But if you're looking for a stable cast, this might not be a great choice for you. Aside from that, though, it remains a solid, fun book. Worth a look, especially if you read any of those stories in Dragon like I did!